Incorrect watering is the #1 killer of orchids. In nature orchids tolerate wind, rain, and long dry periods between showers. As they cling to rocks and trees, their roots are completely exposed to the elements, waiting for the next rain shower. 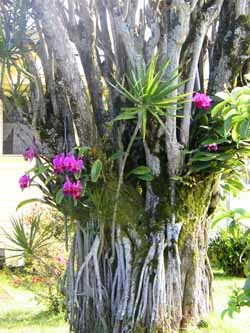 To copy nature, commercial nurseries grow orchids in mixtures of bark, moss, coconut husks, styrofoam chips and other materials. All these potting materials make correct watering difficult. What holds water? What doesn't? Planting materials also vary depending on where your orchid was grown (Hawaii, Florida, Taiwan, ???). It's not unusal to see two identical orchids growing in completely different potting mixes because growers use whatever material is the cheapest and works best for them. That might be styrofoam and coconut husks if your orchid was grown in Florida, or sphagnum moss if it was grown in Taiwan. Growers rarely think about what works best for you! Orchids growing on rocks - no soil here! 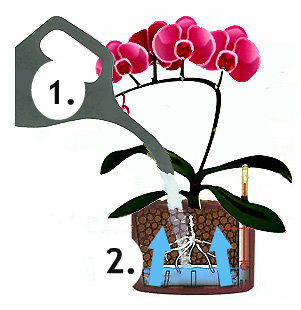 The material your orchid is growing in is the most important element to correct watering. No wonder watering orchids is a mystery - even experienced hobbyists have trouble getting it right. These (man-made) clay pebbles, called LECA, are clean and easy to use. They have excellent capillary properties that "wicks" the moisture up to the plant gently and evenly. A water gauge tells you when and how much to water. 1. Pour water into pot at the top. Water passes through the pebbles to the bottom. Water gauge tells you how much. 2. The capillary properties of the LECA pebbles "wick" the moisture up to the plant's roots gently and evenly. 3. Air circulates through the open spaces between the pebbles as the moisture move up to the roots. This combination of air and moisture creates an ideal environment for root growth. In nature, orchids grow where moisture and nutrients can be scarce. Nutrients are supplied by tree bark, bird droppings, and any other organic matter that happens to come their way. To survive in this harsh environment, they must adapt to living on a slim diet of nutrients. At home, too much fertilizer kills more orchids than too little. I've never seen an orchid die from a lack of fertilizer. If your plant is ailing, the last thing it needs is more fertilizer! Proper nutrition can be difficult with traditional potting materials. How can you get the nutrients right when watering is a guessing game? Our Hydroponic System makes complete nutrition easy. Just add a few drops of our nutrient solution to the water every time you water. Your plant will get everything it needs for healthy growth and big beautiful flowers.